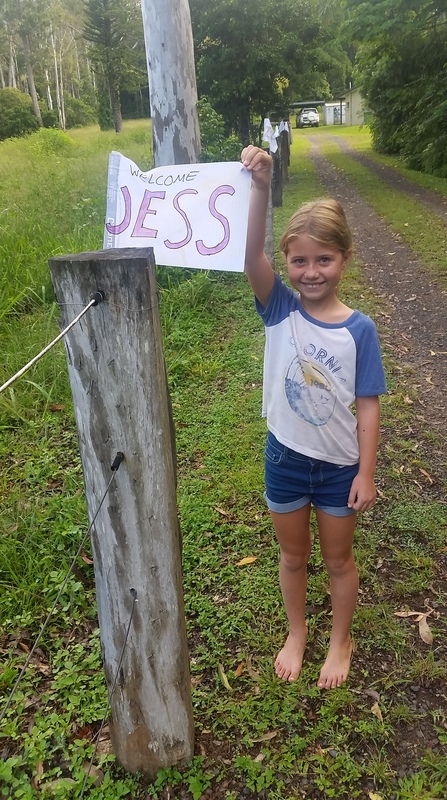 After a few weeks of hot, dry, dusty, desert, rocky and hot (yes I know I said it twice but it really was) weather and landscape, we were all very excited to be heading to the Atherton Tablelands. Not only for the lush green landscape and fresh fruit and vegetables, but most importantly to be visiting our long lost travelling soul mates, the Leeds. 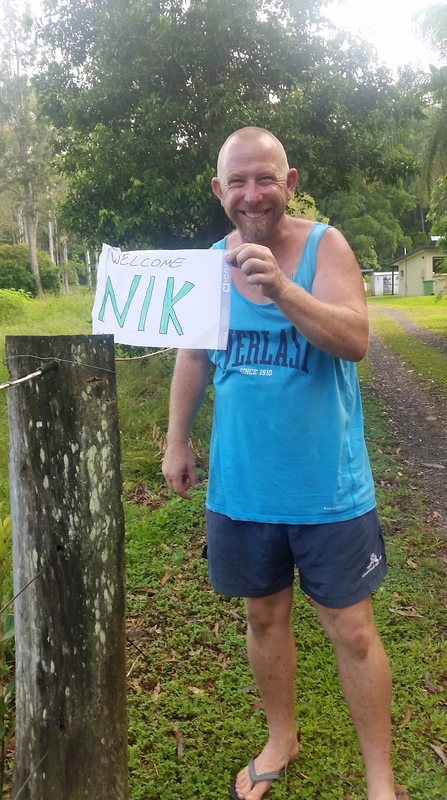 The Leeds have for the time being stopped travelling and have decided to set up home in the beautiful tablelands, so of course we had to call in and then had to take advantage of their hospitality and spend a few weeks catching up and exploring the area, sometimes with them and sometimes without. 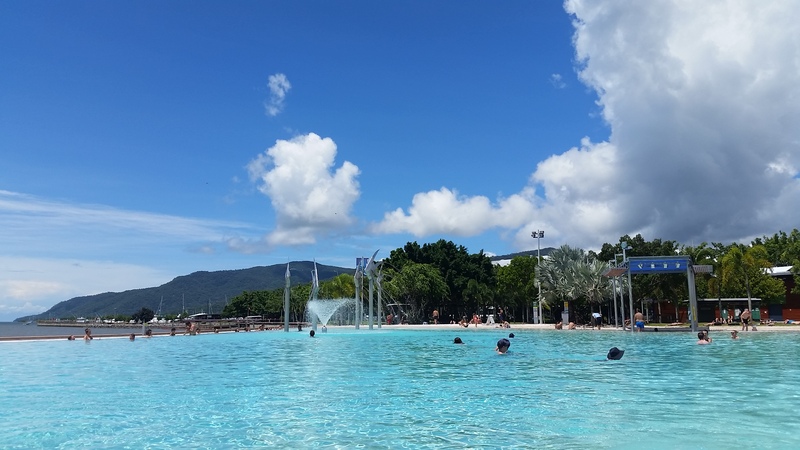 We also ventured ‘down the range’ into Cairns and explored the town, frequenting the free swimming lagoon on the esplanade on more than one occasion. We wandered around the shops, explored Rusty’s Markets and as usual the girls got their shopping centre fix, spending most of their pocket money on clothes, make up, books and leggo. Most importantly though, we thoroughly enjoyed getting a good dose of fruit and vegetables, especially the yummy local bananas and avocados. I think we were making and drinking so many smoothies that our blender decided to crap itself. 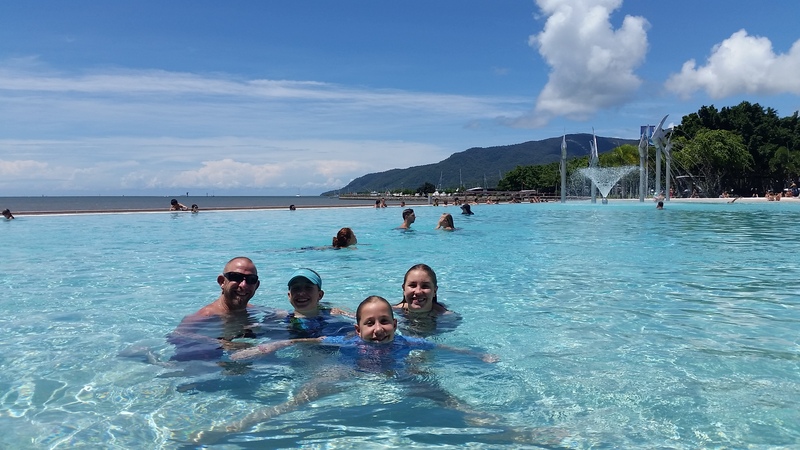 Given that we were in Cairns, we couldn’t pass through without having stayed at Cairns Coconut Resort, which is ranked as the number one caravan park in Australia, which the prices clearly indicated……. Given that we arrived just before the start of the busy tourist season, I was able to score a deal in which we got two kids free, which bought the price down to a double didgit number, that if I tried really hard, I could justify spending so much per night….. We managed to completely justify spending 4 nights at Coconut, which coincided with the arrival of Pauley and Queen Jayne (friends and workmates from Darwin), on their next work stop. With so many ‘things ‘ to do in the park, the kids had a ball, whilst Nik and I caught up with Paul and Jayne. 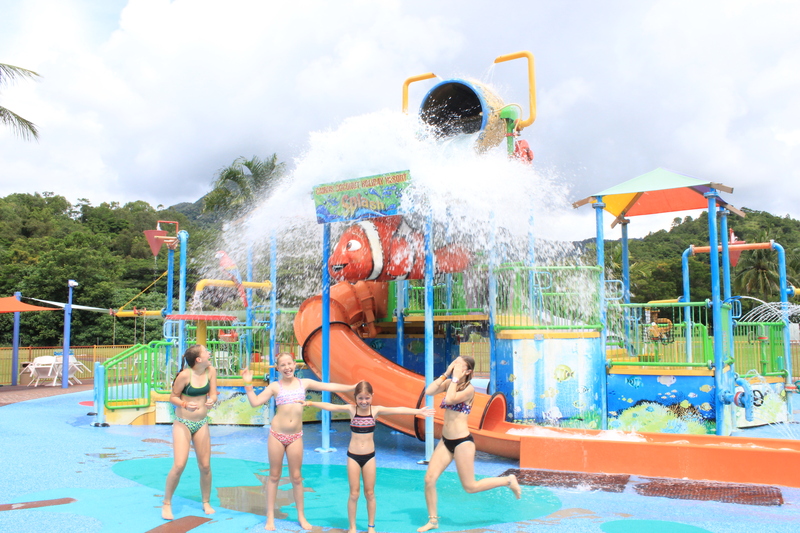 Each morning, Nik, Bec and Zoe did a session at the air conditioned gym, then after breakfast we would head down for a swim in each of the 2 resort pools, before we made our way along the BMX bike track and playground towards the water park, complete with the monster water dumping bucket. 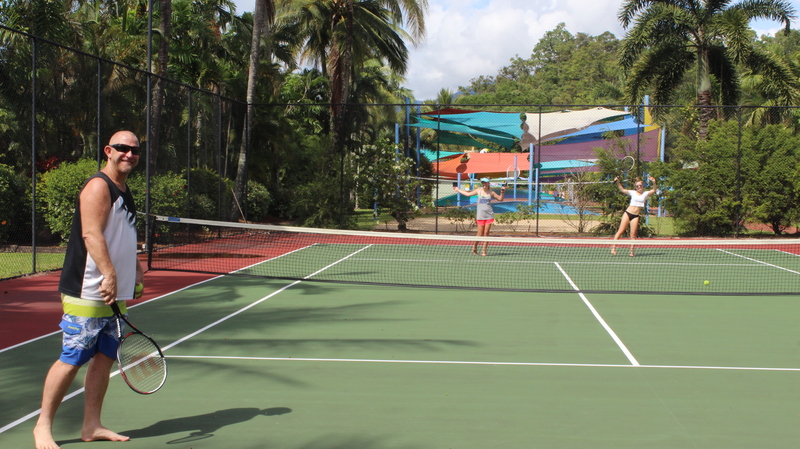 After a quick morning tea we would head back out for a quick hit of tennis and a game of 2 on 2 on the basketball court, then back via the pools for a cool off. 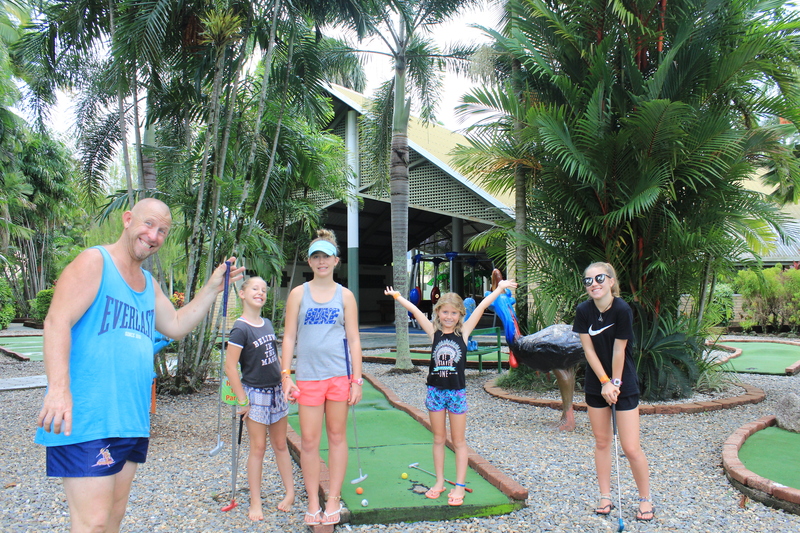 After lunch we rested…… but not for long, as we still needed to fit in a game of mini golf before we cooled off again in the pools. 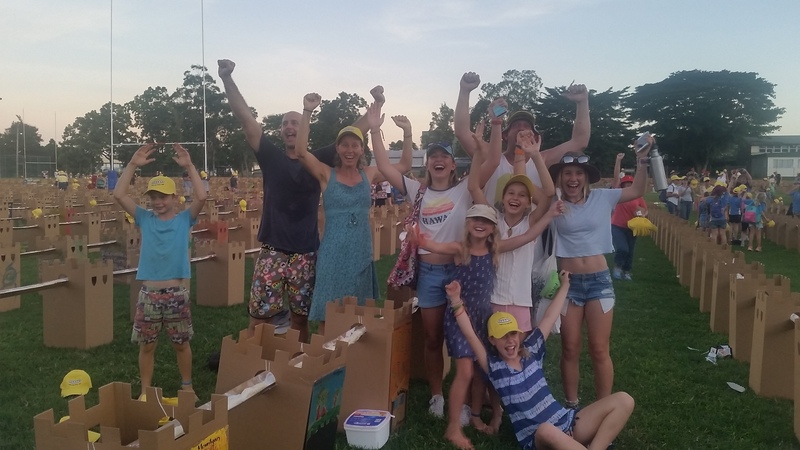 After quickly shoving down our dinner, we then shipped off the younger 2 girls to the games room where there was a nightly movie, ones they’d seen before, but we still made them go as we had paid good money for it!!!!! 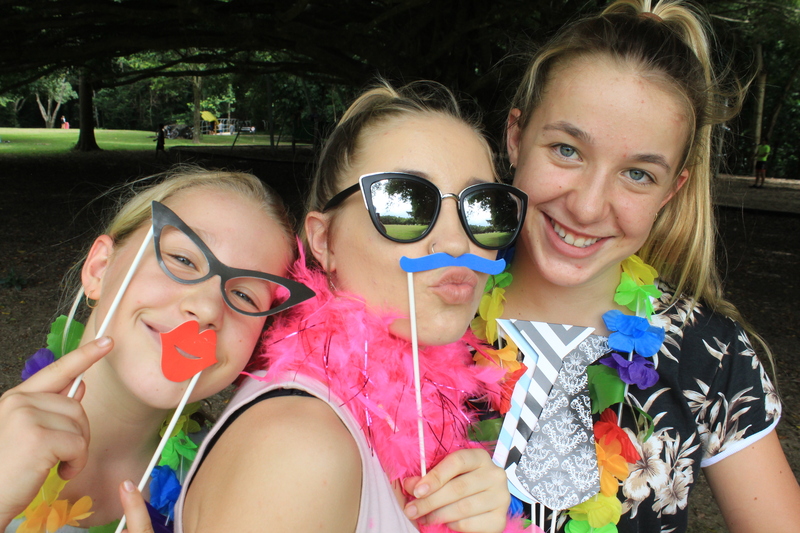 Given our busy couple of days we felt that we needed to head back to the Leeds for some R & R and for the kids to do some schoolwork, as we couldn’t find a spare minute to do it at the park!!! 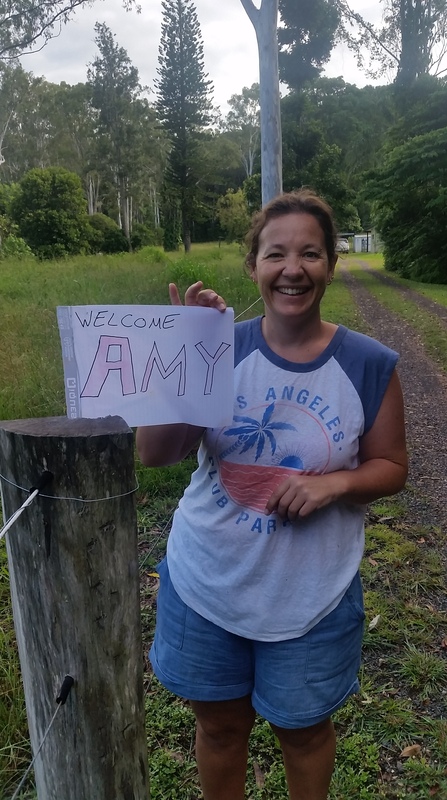 As usual, they welcomed us with open arms and we spent the next couple of weeks relaxing, exploring waterholes and chasing waterfalls around the tablelands. 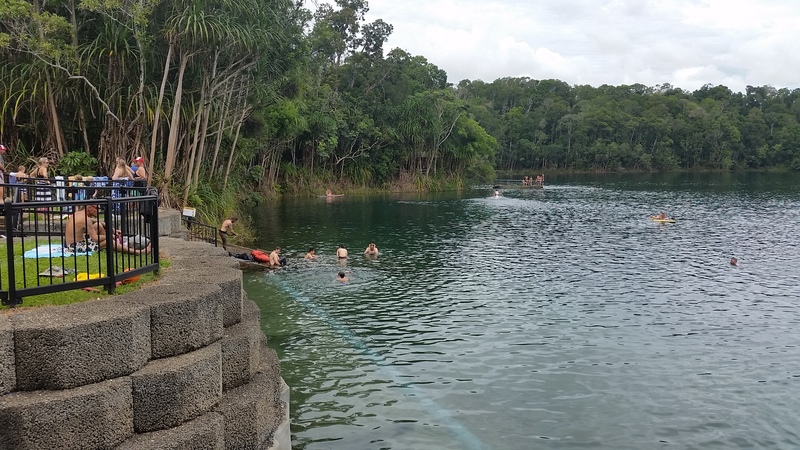 One of our outings was a day spent swimming and kayaking in Lake Eacham, a short drive east of Atherton, past a gorgeous little town called Yungaburra. 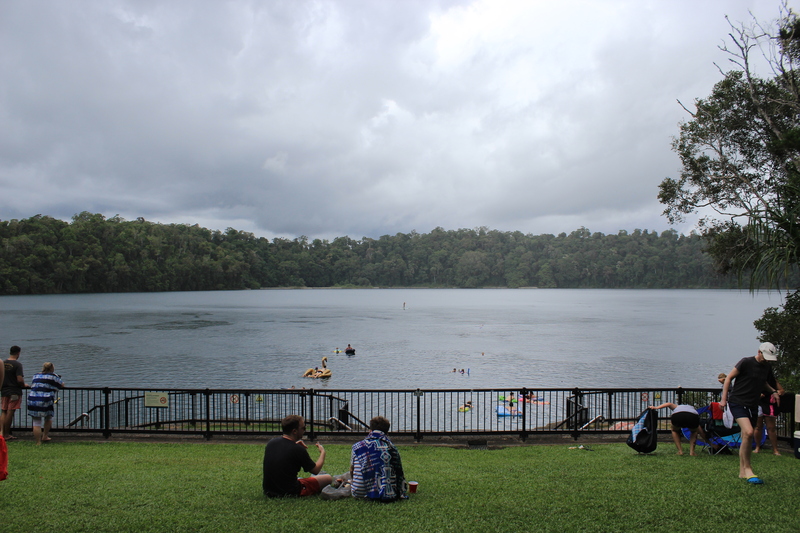 The lake is part of the ‘Wet Tropics World Heritage Area’ and is actually an old vocanic crater that exploded many thousands of years ago. 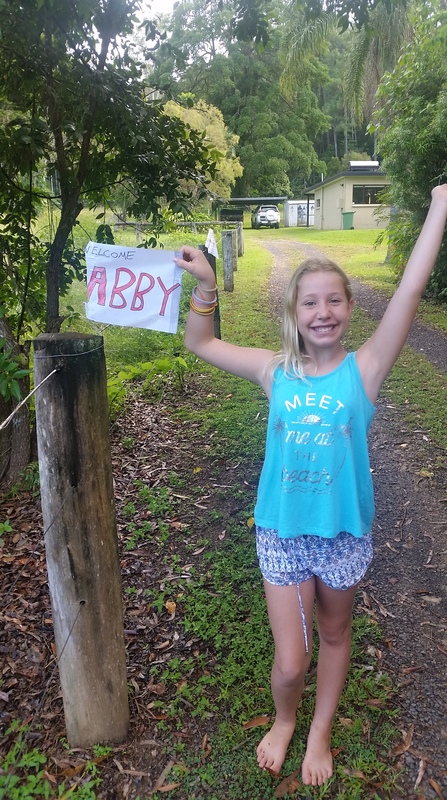 Can you picture the girls eyes glazing over as soon as I mentioned volcano….. they just hip and shouldered me out the way as they walked straight past and headed to the water for a swim. 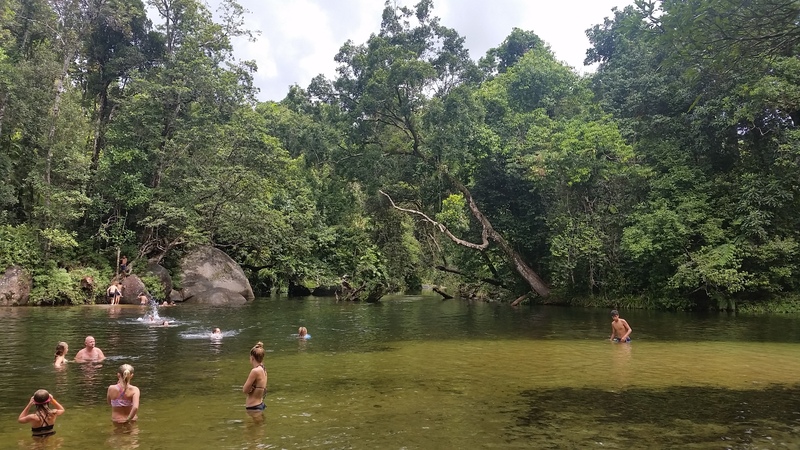 However, I still counted the day as a school day, as there was a small amount of education involved………..
On another day we headed off to follow the waterfall circuit, along with quite a few bus loads of backpackers…. 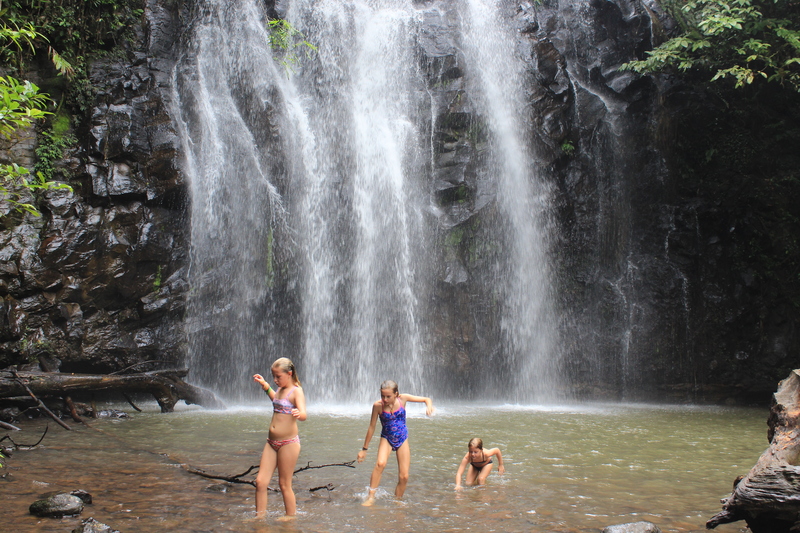 Once we waited long enough for them to complete their quick 5 minute swim before they were bundled back up into the bus for their next destination, we had a ball visiting all the different waterfalls, some we could swim at and some we could only view from the top. I was designated photographer for the day as the water was bloody cold and I was happy just dipping my toes in momentarily before soaking in the beauty of it all. 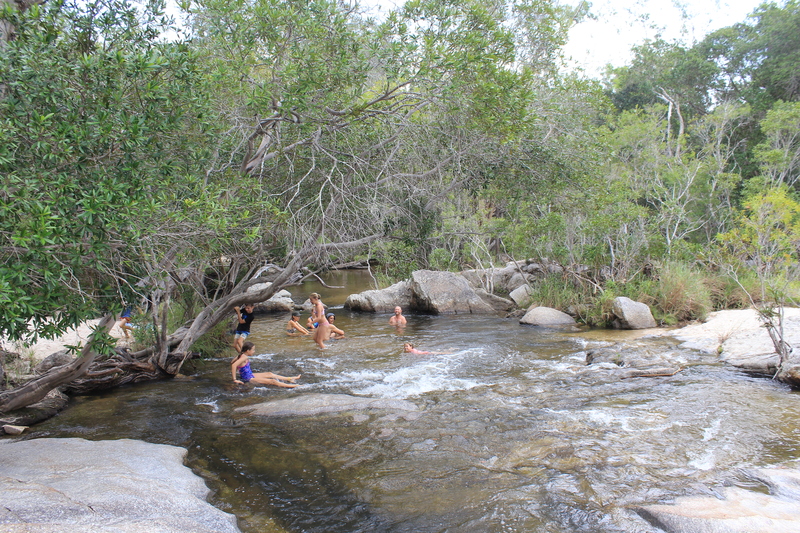 Another day trip involved a drive up through Mareeba and onto Port Douglas (PD to us locals….) 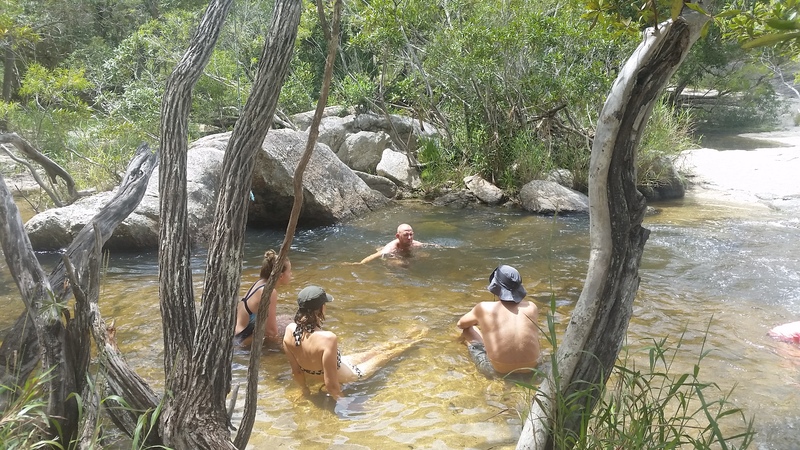 we were hoping and looking forward to having swim in the ocean, however with the development of Cyclone Debbie out in the Coral Sea, the beach had been closed. Although disappointed we still enjoyed ourselves, we took a short stroll along the beach (having a sticky beak at the Lifesaving Club), then a wander down the main street after lunch at the park near the lovely little church. 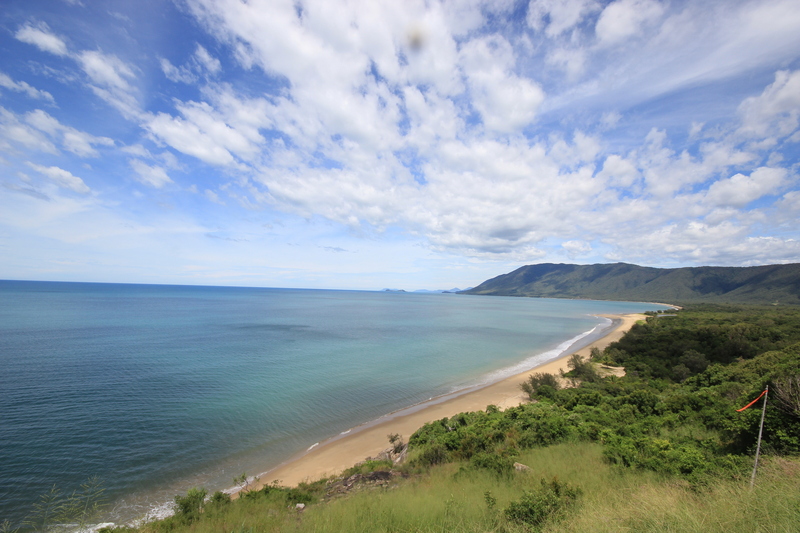 Once back in the car we drove up to the lookout for some amazing aerial views of the beach and coast. 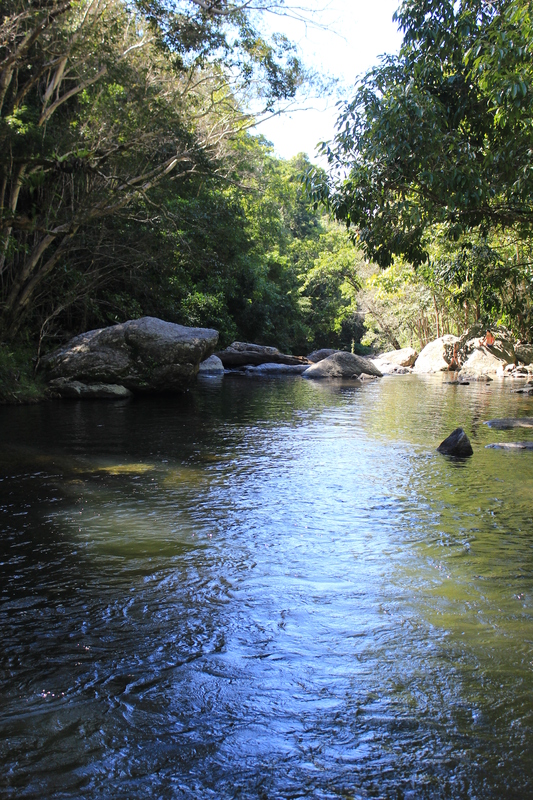 The views from the drive from PD to Cairns. 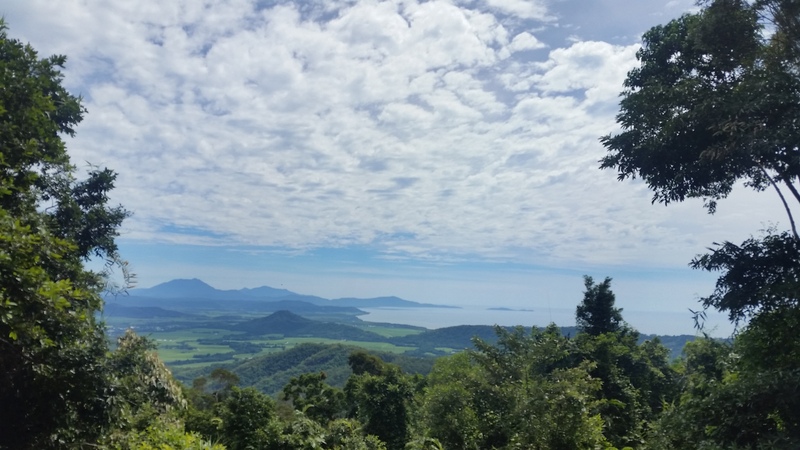 Views of Mossman and the Daintree. Of course we couldn’t not call into the Lifesaving Club!!! 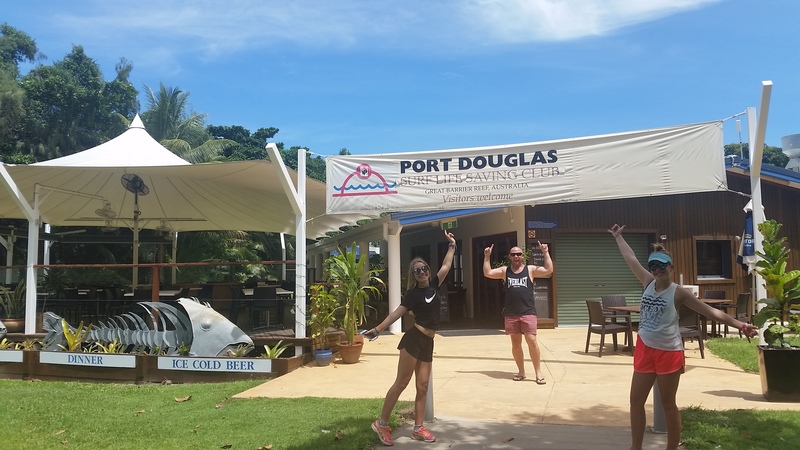 From PD we drove the coast road back down to Cairns, calling in at a few little coastal villages including Ellis Beach and Palm Cove. 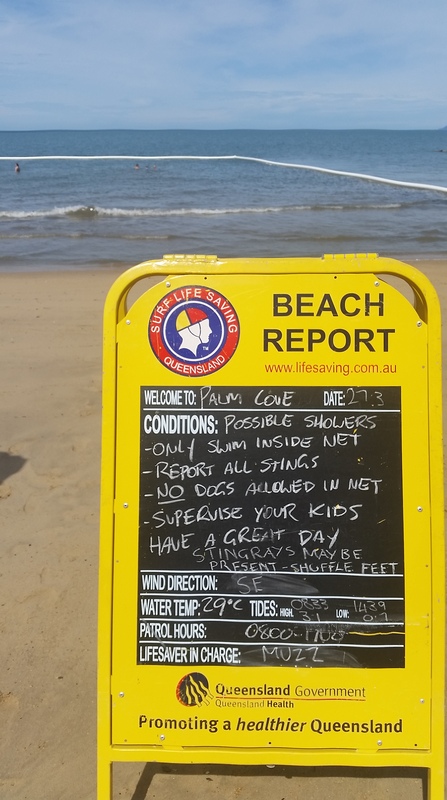 Fortunately the patrolled beach at Palm Cove was open, although I was a little apprehensive with the stinger nets out and signs warning of the presence of stingers and crocodiles. The kids were also instructed to shuffle walk in the water in order to scare away the sting rays…….. Nik and the girls had a ball finally swimming in the ocean for the first time in over 7 months, however I was less excited as I sat on the sand keeping a watchful eye out for crocs and ensuring the girls were shuffling and dragging their feet, whilst anticipating the blood curdling scream resulting from the unmeasurable pain caused by the many dangerous and life threatening tropical stingers that I was reading about on the oh so helpful information board I was sitting next to…….. After Nik and the girls finally got out of the water, we dried off and headed back into Cairns, calling in for more sticky beaks at the northern beaches suburbs of Cairns. 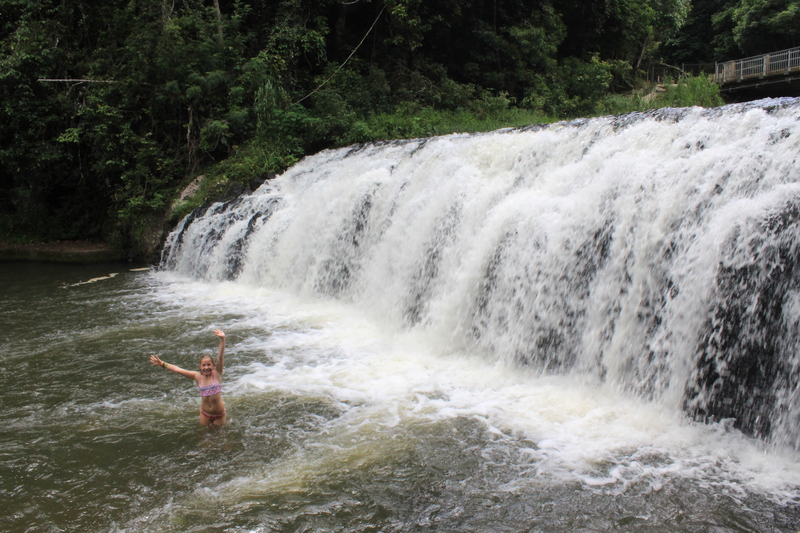 Mmmm, shuffle feet…..made for a relaxing swim, not…. 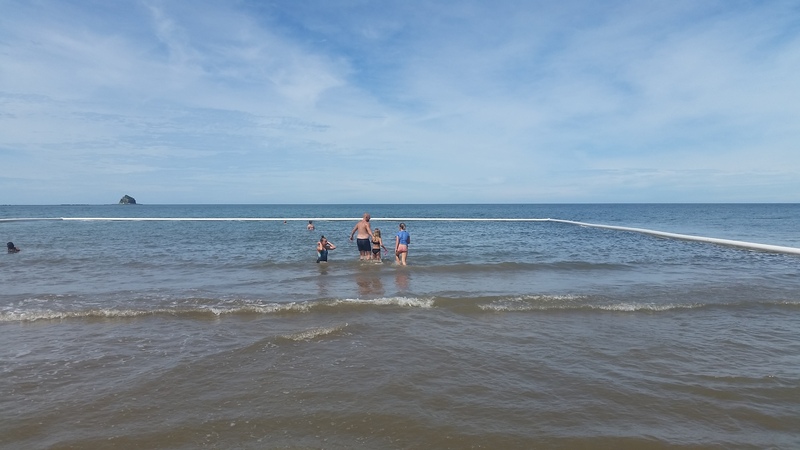 Whilst the lifesavers kept on eye on Nik and the girls swimming, I much prefered this view from where I was sitting. 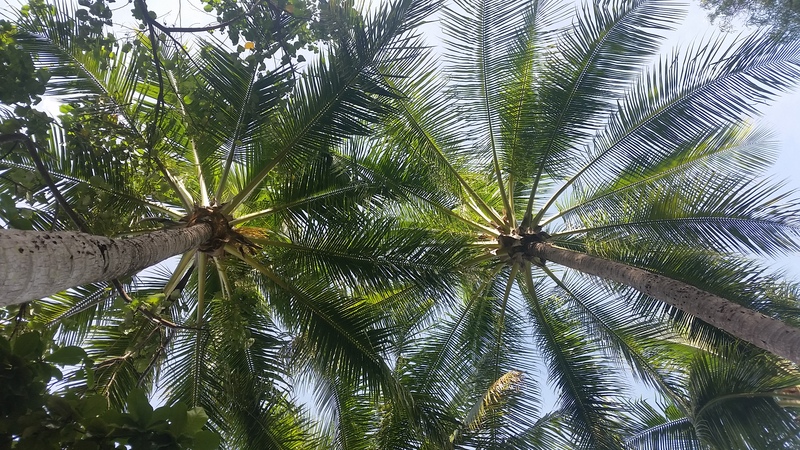 We also managed to make it to a few markets whilst in the area, the usual Cairns Lagoon market as well as the Palm Cove Markets, both were lovely given it was the same stall holders at both, give or take a few. 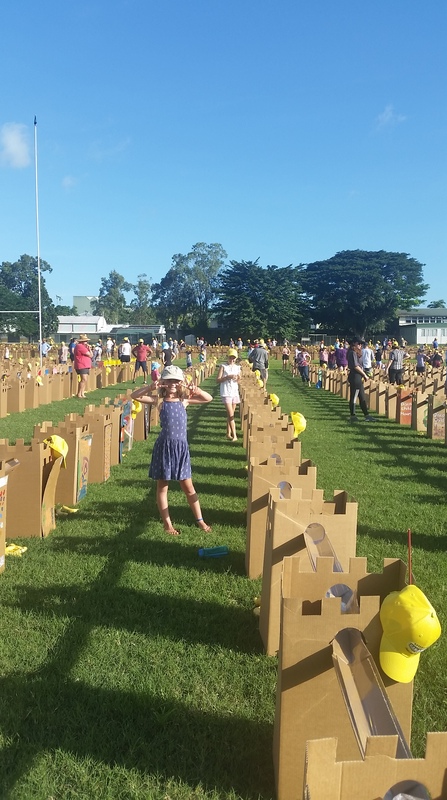 Whilst another HUGE event we attended with the Leeds and our Darwin mates Jayne and Paul, was down to Innisfail for the successful acheivement of the worlds longest banana split, a whopping 9kms long. Jess organising her 5 metres of banana split, with Lucy in the background. 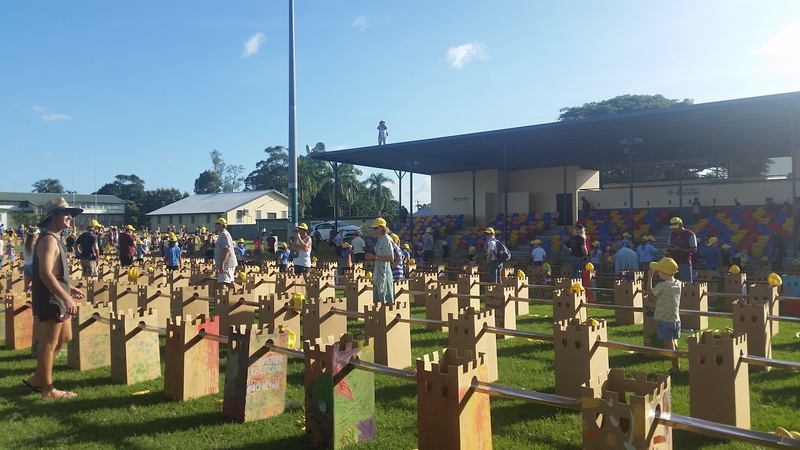 Rows upon rows of banana split baking in the FNQ sun……..
And the winners are……..the crowd went mad when the result was announced, high on bananas and melted ice cream………. 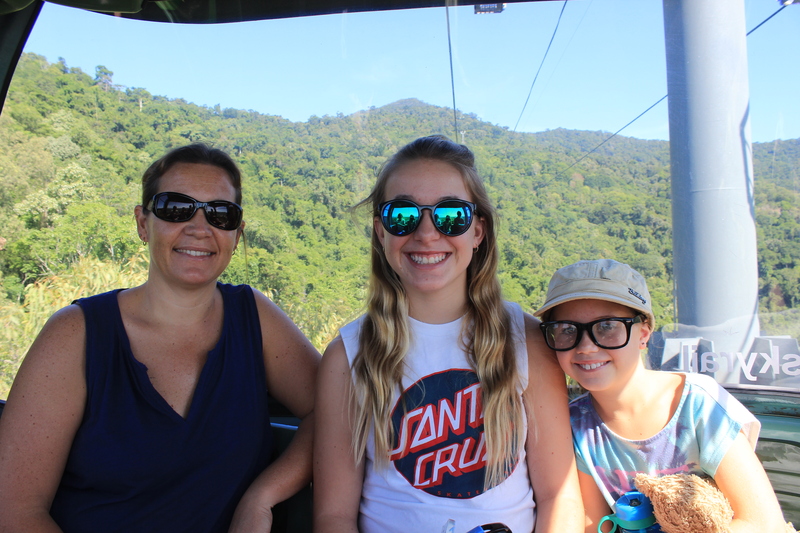 Of course we couldn’t leave Cairns without doing the Skyrail trip up the range and into Kuranda. 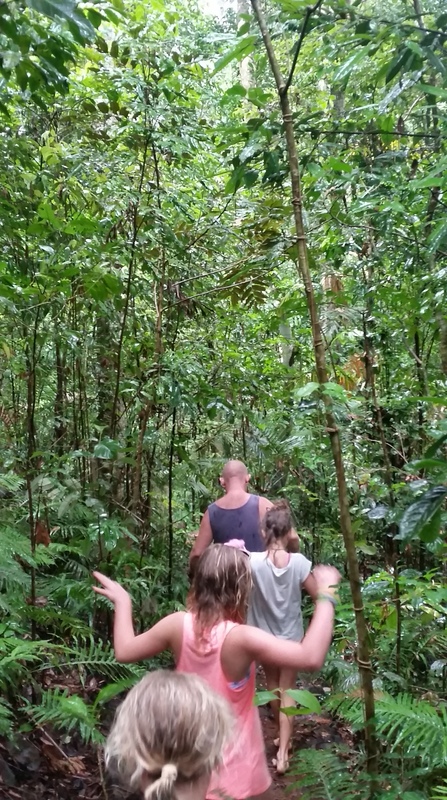 We had hoped to do the Skyrail up and the scenic railway back down, but at a cost of close to $400 I couldn’t justify it, so we saved ourselves $150 and just caught the Skyrail up and back. 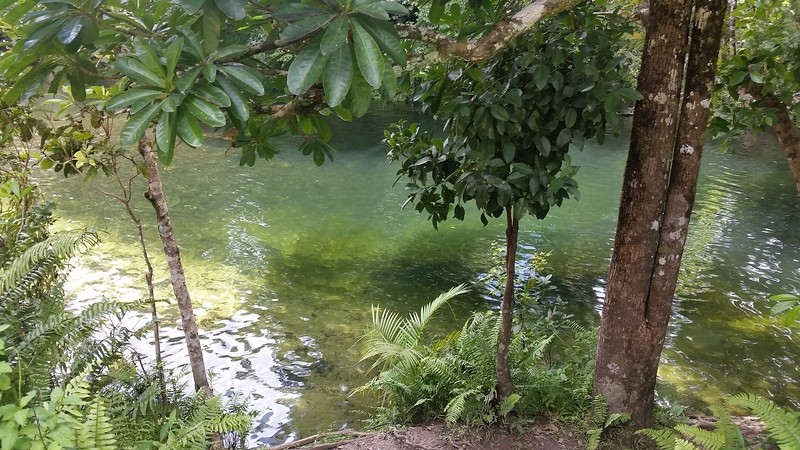 We didn’t spend much time in Kuranda either, as we had previously been there whilst staying with the Leeds and found that it was not really to our liking. The daily markets were cute but predictable and the general vibe we got was that it was perhaps back in the day a pretty cool alternative hippy place to live and visit. However, these days it was all about the tourism dollars and nothing really seemed authentic, overall the best word to describe it was as a ‘try hard’ hippie place that had lost its way. So after an overpriced coffee and ice cream we headed back to the Skyrail station and headed back down the range. The view and scenery was great, however I did find I was holding on quite tighlty as we noisily made our way back down to Cairns. 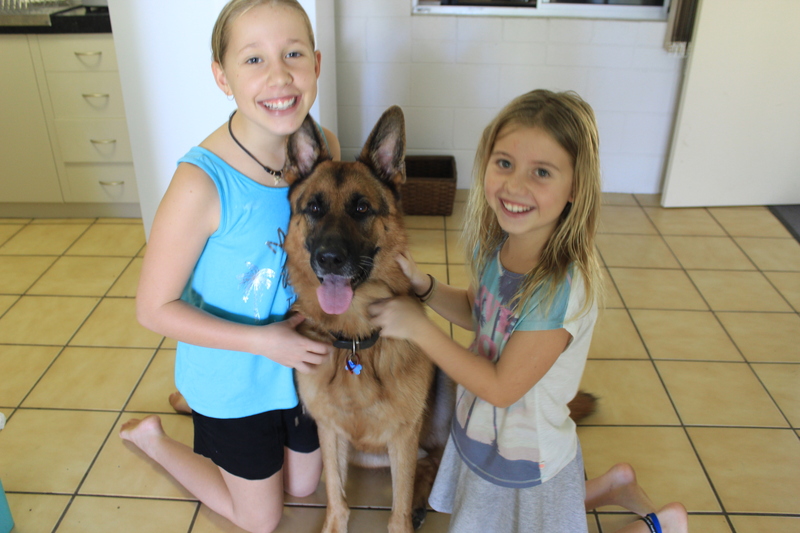 Whilst in Cairns, we also did our first house sit for a young couple, looking after their dog, who coincidently looked exactly like our old German Shepherd. We were there for about 3 weeks and the girls thoroughly enjoyed looking after the dog, feeding, brushing and walking him everyday. The poor dog was probably glad to see the back of us, as either Jess or Abs were constantly patting or hugging him. 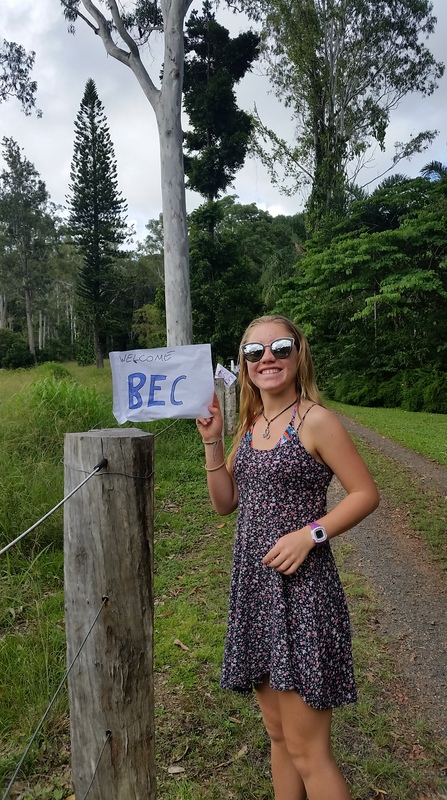 It was great for Bec too, as she was able to go on a few long runs with him by herself. As for Zoe she was happiest talking to him from a distance where he couldn’t slobber and drop dog hair all over her…. 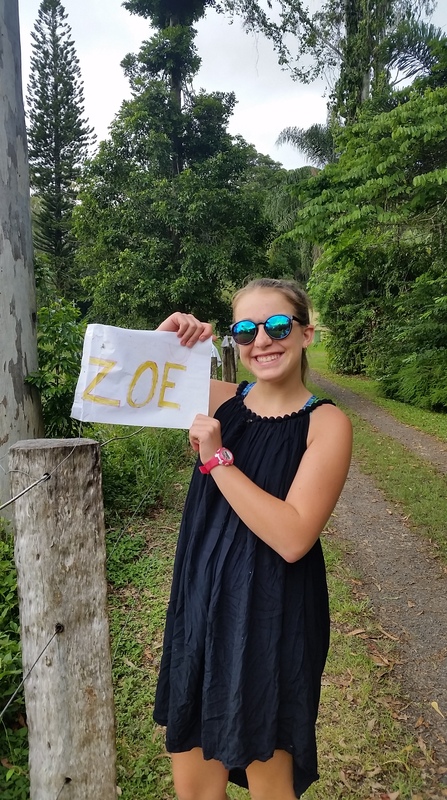 Our time in Cairns also coincided with both Zoe and my birthdays, with Zoes falling on Good Friday, we were limited as to what we could do, so we headed off to Goomboora Park for a picnic lunch, play on the ropes playground and a swim in the river. 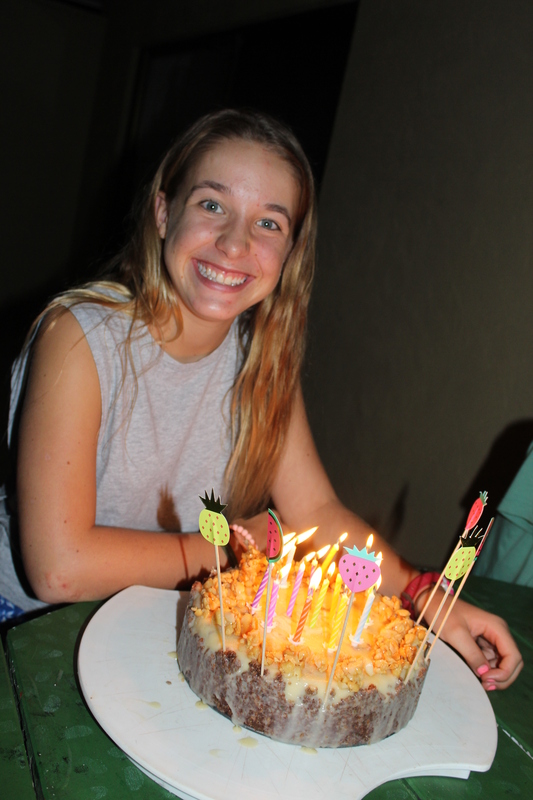 The day was finished off perfectly with a birthday cake that Bec had baked, whilst it was low key we all enjoyed ourselves. The birthday girl and her posse. 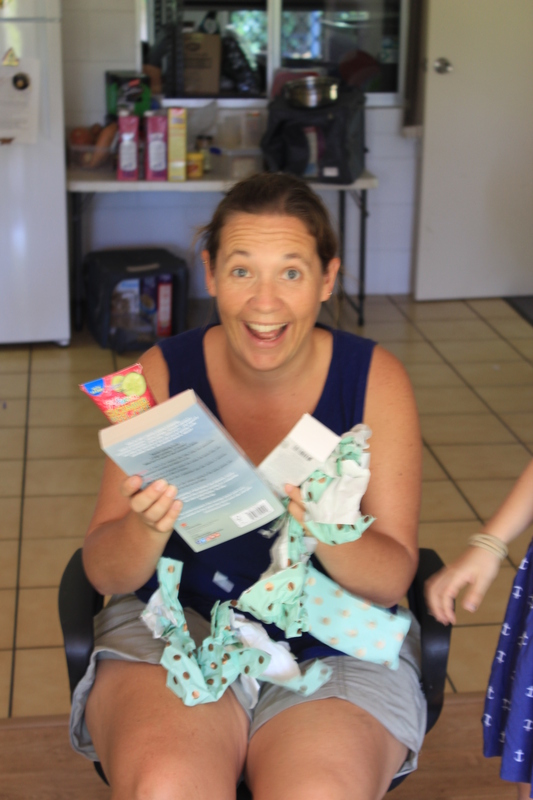 I was also spoilt by the girls on my birthday, as they had set up a ‘salon’ and proceeded to pamper me with a facial, hair treatment, manicure and pedicure, even Nik was lucky enough to receive a pedicure… All this was finished off with Bec baking my favourite desert, Lemon Meringue Pie. 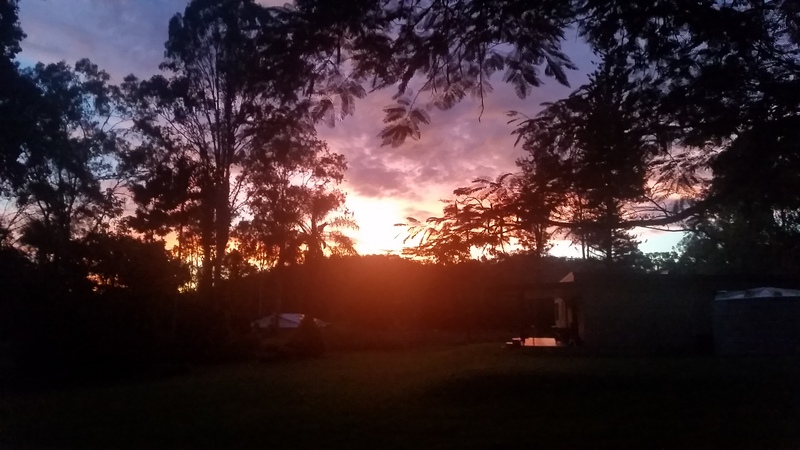 Our last outing and hoorah in Cairns was only a short 12km drive from the caravan park we were staying at in Brinsmead to Crystal Cascades, a beautiful place where we were able to enjoy a picnic lunch and a swim in the very refreshing and very cold water, once again I took the photos…..
One of the many sunsets from the Leeds house. 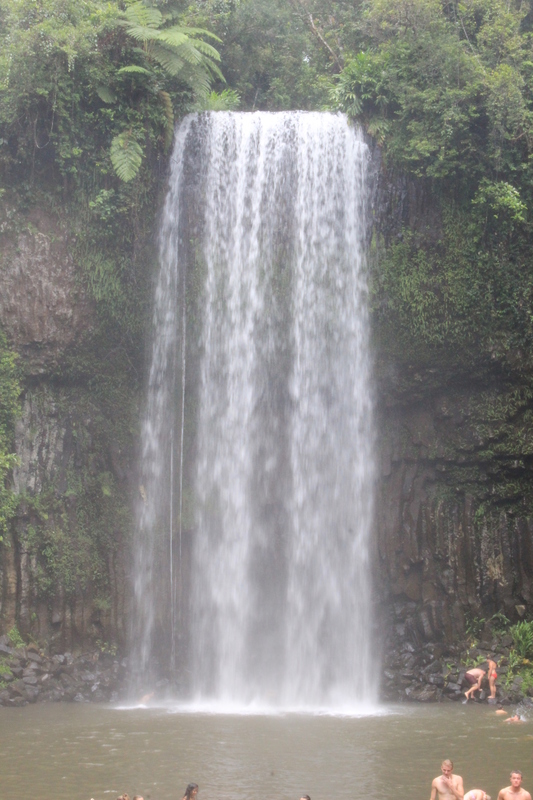 Off on another waterfall exploration.